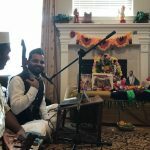 The weekend of May 13-15 was filled with satsangs in Houston, even as devotees from California and Dallas came down to participate in the events. On Friday evening, which was Ekadasi day, a Divya Nama sankirtan was conducted at the residence of Smt. Lekshmi and Sri Jeevan Nair. 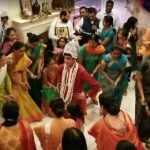 Devotees walked and danced around a vigraha of Lord Krishna as they sang several of Sri Swamiji’s kirtans on Guru, Nama mahima, Krishna, Rama, Panduranga and more. On Saturday, May 14, a 12-hour Akhanda Mahamantra Nama sankirtan was conducted from 6 AM to 6 PM. 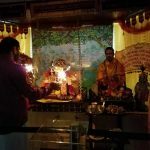 Several devotees from around Houston attended the chanting and obtained the Lord’s blessings. 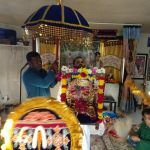 On Sunday, May 15, a special Narasimha jayanti satsang was held at the residence of Smt. Nisha and Sri Sriram Ramanujam. 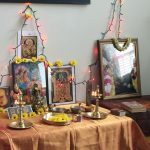 Parayanam of Prahlada charitra from Srimad Bhagavatam was performed, interspersed with explanations of some slokas by Sri Radhakrishnan Nair and Sri Ramaswamy. After the parayanam, Sri Ramaswamy gave a wonderful talk on Prahlada charitram. 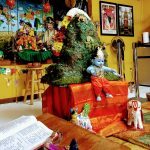 Following this, kirtans on Lord Narasimha as well as several other kirtans were sung by the devotees present. The satsang concluded with pooja and harathi.